Here are some of our Photos. At Bohol tropics ground one sunny afternoon. In our hotel overlooking at Tagbilaran port and Cebu island. 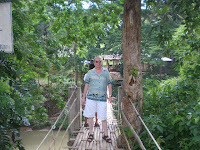 One place in Bohol, Loboc - hanging bridge. 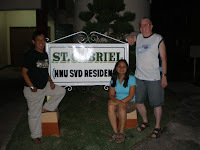 With Fr Milo at HNU- SVD residence nice to met him again after 4 yrs. He is our regent in Legazpi. Beach in Panglao ,,,nice to swim but imagine how to swim in low -tide hahaha...i love beach thats why kahit low tide talagang tampisaw ako. Kung pwede lng kargahin ang dagat pa Germany. 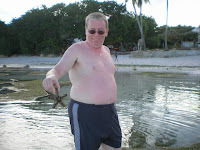 Mike star fish- di sa kanya mahiwalay. 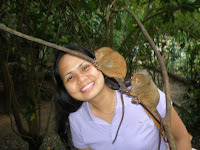 These was our third visit in Bohol which i called and described as the first love of my husband. He really like and love Bohol maybe because of its scenery and location. 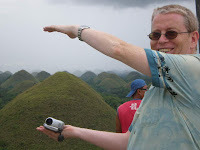 I like Bohol too people are so friendly and its wonderful nature. He was affraid to stay in Legazpi because of Mt. Mayon and earthquake which we encountered when we been there - having intensity of 6 pt. something and the second night was intensity 4. Maybe because of Mt mayon was active again. Still i love my place where i was born- LEGAZPI CITY the uragon place! got it in small pocketbook of information i bought in national bookstore in bohol. Wow naman kakaingit, im gonna show this to John coz he really wanna go there.. One of the Pinoy here told him to go to Bohol too! Hello Fe, thanks for sharing these pics.You might wonder kung bakit ko inabangan yong pics nyo, because we are planning to go to bohol, for an important visit at sabay lakwatsa na rin. Actually my father was came from Panglao, but I never been there. So this year punta kami together with some relatives to tagbilaran. Maybe you can recomend to me yong hotel na pinag stayhan nyo? mahal ba? o heto ha lubos lubosin ko na tanong hehe. Whats the name of the hotel? Many says that bohol have a scenic beauty kaya ayon na intriga hehe. Maybe you can help us and give some info on where to stay safely in Bohol. Sory ha nabigyan kita ng headache. Thanks in advance. I like to see all the pictures. mads soon in summer try bohol. We stayed at Bohol tropics. 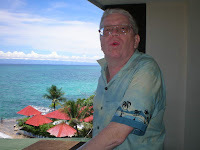 our room was de luxe room big enaf for 2 person which my husband enjoyed overlooking sa tagbilaran port. 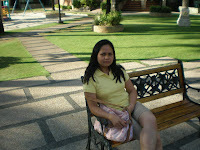 You can visit there site www.boholtropics.com makikita mo na din dun mga prices nila. 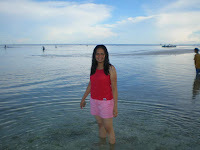 In panglao also meron din mga hotel tulad ng alona beach resort na many more if like nyo everyday sa dagat. but we stayed in tropics thats within the city. Dont worry about safety in BOhol they are friendly and foriegn oriented people, dahil nga karamihan sa mga nag totour dun mga foriegner kaya di nakakatakot. wahehee makaulok man vacation nio dati ngkaron ng lindol,lol....buti mayo PTSD agum mo...ingt pirmi!!! tsaka sympre, there's no place like HOME!!! di man natakot si agom ko nakasmile pa ta feel nyang naglayaw layaw so room, kahit solo sya duman ta nasa baba ako. but ako lula till now! salamaton sa comment! Thanks sa sagot, I saved the link. Buti nalang mabait yong online friend ko hehe. I will check the link again tonight after work. Hello Faye, your blog is interesting as well as this particular post. You are right, Bohol is beautiful! You would want to come back again and again and again. Btw, I'm gonna link this to both my blogs. I hope you can do the same. Good post and this fill someone in on helped me alot in my college assignement. Thanks you as your information. Back in Circulation of Computer world!